Boston 1775: Discussing Leadership at Bunker Hill at Cambridge Forum, 11 Dec.
I’ll be Nat’s interlocutor in this discussion. After his opening remarks, we’ll talk about the Patriot leaders at the start of the Revolutionary War—men like Dr. Joseph Warren, Artemas Ward, and a forty-three-year-old gentleman from Virginia named George Washington. There will be time for questions from the audience, and Nat will sign copies of his book for folks on your holiday list. After the Battle of Bunker Hill, and in the historiography since, people fervently debated who was in charge of the American forces, who should have been in charge, and what that commander (or those commanders) should have done. The very history of that debate seems to indicate some significant vacuum or disagreement at the top. Paradoxically, however, the Battle of Bunker Hill decided the siege of Boston. 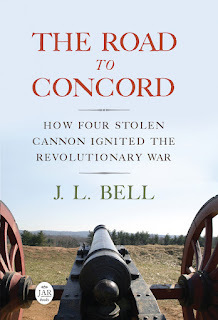 Though the provincial troops lost the ground they were defending and had to retreat off the Charlestown peninsula, they inflicted such casualties on their foe that British commanders began to advocate for withdrawing from Boston and putting down the American rebellion from a less hostile base. It was a delayed success. So did flaws in American leadership during that battle, or during the spring of 1775, matter that much? Had political leaders in the preceding years instilled such fervency into the New England populace that it could fight two major battles against the king’s army without a firm and unified command? Did any of Gen. Washington’s plans and initiatives over the following eight months make a real difference? Or did they have delayed benefits as well, bearing fruit after the Boston campaign when the new Continental Army faced a stronger enemy in less supportive regions? Come join the Cambridge Forum discussion at First Parish, 3 Church Street in Harvard Square, at 7:00 P.M. next Wednesday, 11 December. This event is co-sponsored by the Friends of the Longfellow House–Washington’s Headquarters, the National Park Service (Longfellow House–Washington’s Headquarters National Historic Site and Boston National Historical Park), and the Massachusetts Society of the Cincinnati.